Trump’s cabinet choices include a bigot for attorney general but the foulness doesn’t stop there. Mr. Bulging Neck’s entire list of right-wing nut-jobs is scary and aromatic. Truly, the Clones of Dr. Trumpenstein are invading the U.S. government. There are two ways to look at the nomination of racist Alabama senator Jeff Sessions to be Attorney General of the United States. On the one hand, it’s encouraging that 1,100+ law school professors from 48 states are protesting the idea of a white supremacist becoming the nation’s top cop. On the other hand, it’s alarming that only 1,100+ law school professors from just 48 states are protesting the idea of a white supremacist becoming the nation’s top cop. Let’s look at some of the lowlights of the career of that towering intellect, Jefferson Beauregard Sessions III. 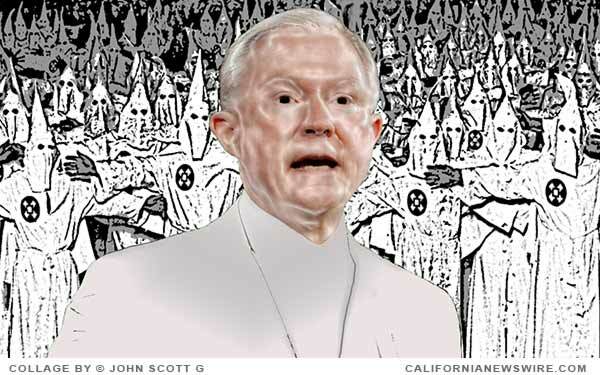 The diminutive Sessions once said of the Ku Klux Klan, “I thought those guys were okay until I learned they smoked pot.” Attempting to counter charges of racism, the Southern Mini-Me claimed to have worked on numerous civil-rights cases — which was nice except for one teeny problem: he didn’t work on those civil-rights cases. When Beauregard was serving as state AG in Alabama, Little Jeffrey prosecuted black citizens who were attempting to assist others in voting. Petite Beauregard called the NAACP “anti-American” and described the Voting Rights Act of 1965 as a “piece of intrusive legislation.” To sub-human creatures like Jeff Sessions, it must be annoying when a nation that prides itself on equality actually insists on applying equality under the law. ~ For Secretary of State, the Orange Whale has selected Rex Tillerson, president and chief executive of oil cartel Exxon Mobil, a firm that fought against climate change that was predicted by its own scientists. Tillerson’s close ties with Vladimir Putin are also troubling. ~ Named to head up the Department of Education is Betsy DeVos, a RWNJ whose lifelong passion is the dismantling of America’s education system. ~ For the Energy Department (which is in charge of our nation’s nuclear weapons), the nominee is Rick “oops” Perry. In addition to wanting to get rid of the department, there is the annoying problem of Mr. Perry’s stupidity. Rick Perry would fail an I.Q. test; hell, he has trouble spelling it. ~ To lead the Environmental Protection Agency how about a man who is against environmental protection? Yup, the Hair-Do Hitler has tapped Scott Pruitt, who has ties to the fossil fuel industry. ~ For Treasury Secretary, the Mr. Comb-over turned over a rock to find Steven “Mr. Foreclosure” Mnuchin from Goldman Sachs. ~ Already appointed Chief Strategist is white supremacist Stephen K. Bannon, head of NotVeryBrightBart, one of conservatism’s many rank sites for fake news, racist commentary, and conspiracy theories. “People lost their homes and pensions because of Republican economic schemes, but the top 1% made money from the meltdown and that’s what we mean by conservative values!” Like I said: funny weird, not funny ha-ha. Decent people, the joke’s on you.